Saratoga Race Course has seen the mighty fall, champions thwarted and punters sick to their stomachs. It’s what she does, folks. It’s who she is. It is often you will see longtime and novice racing fans go to the track on big days just to see the greats compete. To see for ourselves just how fast, strong and powerful a creature they are. They give us a hero for a day, maybe a year, maybe longer. They can, and have, made us fans for life. But a part of us recognizes it’s just as much of a thrill to see the 1/9 favorite get beat by some high priced horse that we thought had no business being there in the first place. To watch someone shake off the chalk at a hundred to one. The big races at the Spa always give us a piece of racing history and a story to tell long after the race has been run. And ain’t it just the coolest thing? Upset beats Man O War in The Sanford. Onion tops Secretariat in The Whitney. It’s In The Air beats Davona Dale in the Alabama. Classy Mirage beats Inside Information in The Ballerina. These stories could fill a book, and have. Bill Heller’s Graveyard of Champions is a joy to read and cannot be put down. Then there was my heartbreak. The 1982 Travers . The Kentucky Derby, Preakness and Belmont Stakes winners met. There was a lot of buildup for this race because we were finally going to see who the best of the lot was. Belmont winner Conquistador Cielo was the unmitigated favorite at 2/5 and had my childhood hero, Eddie Maple, aboard. I couldn’t wait for Eddie to win his third straight Travers. As luck would have it, or the ghosts of Saratoga would direct it, none of ’em won. They all got beat by a gray Canadian import named Runaway Groom. I was 13 at the time and perhaps the first (and only) time I cursed Saratoga and her tradition of burying favorites. My open frustration resulted in a one-day suspension from racing. Not by NYRA, of course, but an entity more powerful. 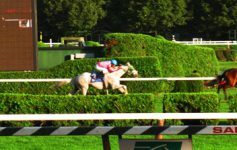 But few upsets have impacted the tradition and mystique of Saratoga Racetrack like the 1930 Travers Stakes. The hype surrounded Triple Crown winner Gallant Fox and the prior year’s racing standout Whichone. They met twice before in 1929, each earning a victory over the other. The Fox went to post as the Travers 1-to-2 favorite. FDR was there. So was his bride, Eleanor. It was a big day and it had the makings of a great duel. But on this day, neither would claim bragging rights. The track was messy and the Fox had never raced in the off going before. Gallant Fox and Whichone went at it from the start. They raced heads apart as they passed the stands, into the clubhouse turn and up the backside. At the far turn Whichone carried the Fox wide, opening a huge hole on the rail. A virtual no-name, Jim Dandy, shot through the opening and raced like a runaway freight train down the lane. He opened up his lead by two, then three lengths. Past the sixteenth pole he was in front by six and his lead was widening. At the wire this horse from California, who went off at 100-1, defeated the winner of the 1930 Triple Crown by eight lengths. The phrase Graveyard of Champions was cemented in Saratoga tradition and a legion of racing fans were left with their mouths gaping. They likely all asked the same question: Who in blazes is Jim Dandy? He wasn’t anything to get excited about during his career. He broke his maiden at two, racing at Churchill Downs in May 1929. He didn’t win another race until The Saratoga Cup at 50-1 in August on an off going. He hadn’t won another all year. His Travers upset was the lone victory of his 20 starts in 1930 before fading into a relative obscurity, racing in Mexico at the old Agua Caliente Racetrack. He competed for eight more seasons, compiling a total of 141 starts, winning seven. In 1964, the NYRA named a race after him and it has served as a key prep race for the Travers Stakes ever since. They’ll run its 47th edition tomorrow afternoon. Since then, eight horses have used it as a catapult to victory in the Mid-Summer Derby, nine if you include Affirmed who was disqualified from first to second in 1978. The day they ran the 1930 Travers people may have wondered who Jim Dandy was. Today, he and his 100-1 odds are the ideal example of why we run the races. It’s because there are no sure things. It’s because on any given race day, a champion can fold. An unknown can shine. And you and I can make a buck or two in the process. It’s what she does, folks. It’s who she is. Take her or leave her. I Want Another, So Do I or Don’t I?